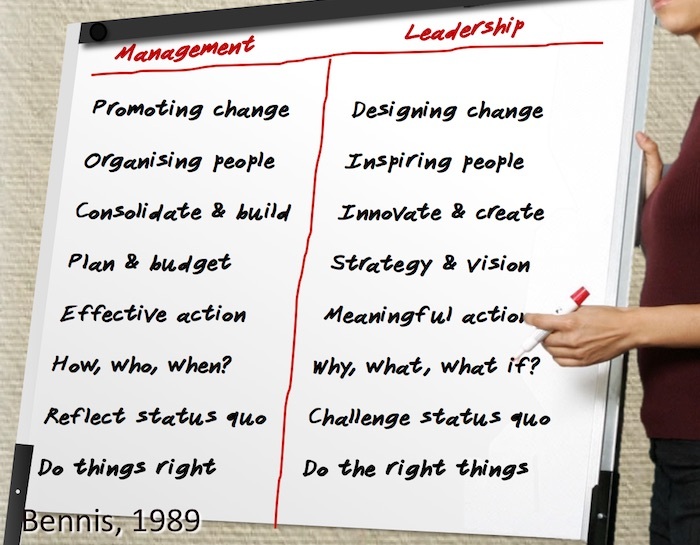 On of the most familiar components of management and leadership training is Warren Bennis’s comparison between leadership and management. Managers promote change, but it is the role of leaders to design it. Managers need to take effective action, while leaders need to ensure that their actions are meaningful. And, of course, making its appearance in hundreds of leadership and political speeches, managers need to do things right, but it is the role of leaders to ‘do the right things’. Who wouldn’t see leadership as the senior role, the more appealing role, the more challenging role? Well, I would certainly like to be seen as a leader: visionary, creative, and inspirational. But is leadership really the harder role to fulfil? Leadership is role in itself, just like management. And I can easily recall leaders who are good at their role and do pretty much all of Bennis’s leadership task – and they do them well. Ann many of them don’t need to do any management at all. They have managers for that. As successful leaders, they simply inspire, challenge and motivate their managers. It is the managers who then get things done, by promoting the change their leaders design, taking effective action, and consolidating and building on what their leaders have envisioned. I’ve known (and trained) many, many managers. And the best of them can cover off all of Bennis’s ‘left-hand-side’ with calm, efficient rigour. But they also seem to spend a lot of tie on the right-hand side of the chart. And the reason why is obvious. Managers manage people. And how can you deliver results through people without integrity, inspiration, challenge, and yes… leadership? To manage, you must lead. … because leadership means leading. Management, on the other hand, means managing and leading. And, if you want to do it really well, that’s got to be the tougher gig.